Every summer, my dad constructs a huge tomato garden in our backyard. Whenever I come home to visit, he whips up a caprese salad with some garlic rubbed crostini using the tomatoes from the garden. I think this is why caprese has always been a favorite of mine–it reminds me of home. It tastes like warm summer nights on my parents deck, drinking cocktails and playing cribbage. Tomatoes picked straight from the vine are like no other, especially when they’re still warm from the sun. Their flavors are so vibrant and bright, you’ll never want to eat store bought again. That being said, I did not use homegrown tomatoes for this dish. But, please, do so if you have the opportunity! I had hoped to post this last week before the Super Bowl, but work (also, being lazy) got in the way. However, these adorable, bite-size skewers are a great appetizer for any gathering or celebration. My friend, Carissa, and I made them for our Friendsmas “party” (it was just the two of us) and we ate them all. I love that you can just pop them in your mouth all at once and the fresh tomato and mozzarella pair so well with the tanginess of the balsamic vinegar. The ingredients are simple. The assembly is easy. And, the presentation is playful. There’s really not a lot to not love about these, so try them out for your next get together! Cut the cherry tomatoes in half widthwise. This creates a flat surface, making it possible to stand them upright on the plate. Rip the basil leaves in half or thirds, depending on your preference. 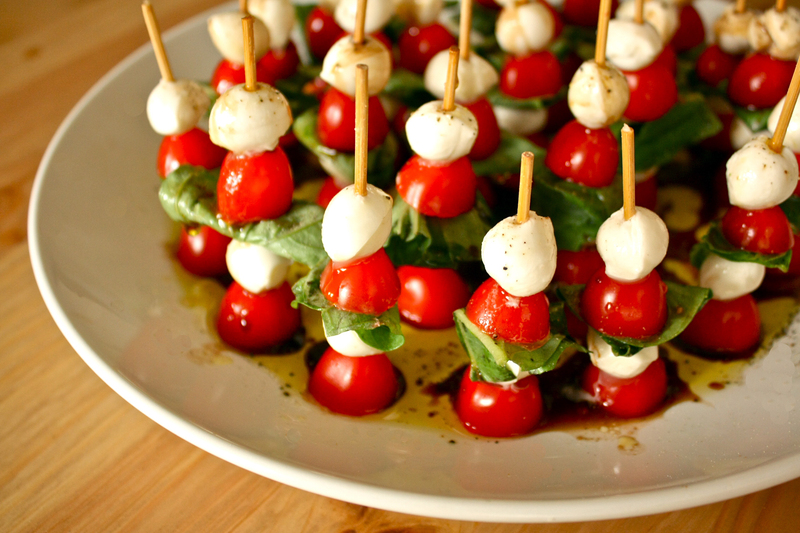 Next, assemble the skewers with the tomatoes, basil, and mozzarella balls in any order you’d like. Stand them upright on a plate and drizzle with olive oil and balsamic vinegar. Sprinkle with salt and pepper and call it a day. *Serve at room temp as it will heighten the natural flavors of the tomato and mozzarella. What a great idea – and I love that they are not messy apps to eat! Now, I can’t wait for summer and those lovely warm jewels in the garden!